This has been housed in one studio location only. It's in excellent condition but out of the original box. Is a fully featured, single-channel microphone preamp and channel strip that offers high-quality sound and a wide variety of signal processing. The 1U unit is a re-imagined version of the company's 230 preamp, and is designed for professional studio, stage, and broadcast applications. It sports an array of I/O including XLR mic and 1/4" instrument inputs; XLR and 1/4" outputs; AES/EBU, S/PDIF, and TOSLink digital outputs; and Wordclock in and out. Balanced 1/4 insert send-and-return jacks allow for patching in external processors. The preamp is Aphex's patented Reflected Plate Amplifier (RPA) type, designed to provide ultra-wide bandwidth and maximum gain and headroom. It features a transformerless design, and contains a second-stage 12AT7/ECC81 Dual Triode tube. 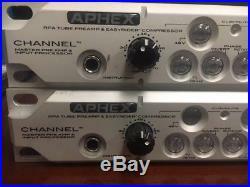 The Channel is also equipped with six built-in processors including several patented Aphex effects. 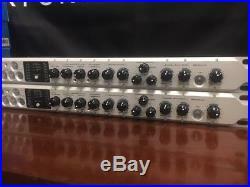 You get the Aural Exciter, for dialing in additional presence and clarity to the signal; Big Bottom, which provides deeper and more resonant bass; the EasyRider Class A compressor, featuring automatic adjustment of attack and release parameters based on the characteristics of the input signal; and the Logic Assisted Gate, which helps eliminate false triggers, clicks, and chattering. In addition, there's a fully parametric EQ band for adjusting the midrange frequencies between Big Bottom and the Aural Exciter, and a de-esser. Ultra-wide bandwidth, maximum gain and headroom. Lower operating temperature than conventional tube designs for longer tube life. 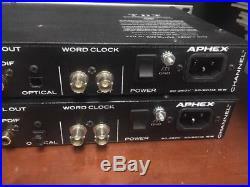 Each unit is individually tuned at the Aphex factory for unparalleled consistency any two units are a matched pair. Aphex's patented Wave Dependent Compressor automatically adjusts attack and release times according to program complexity. No-Knee compression curve circuitry automatically adjusts compression ratio based on program levels. 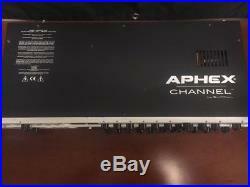 Includes Aphex's 1001 Class A Voltage Controlled Attenuator, used in the Compellor and Dominator. Patented gate technology designed to avoid false triggers, clicks and chattering. Split band universal de-esser designed to maintain presence while dramatically reducing sibilance on any voice. Patented technology for deeper and more resonant bass with little or no increase in peak output. Gives you the ability to precisely fine tune the all-important midrange between the Big Bottom and Aural Exciter. Patented technology for increased presence and clarity with improved detail and intelligibility. 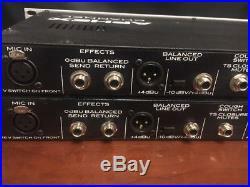 AES/EBU, S/PDIF, and TOSLink digital outputs. Handy for broadcast applications; mute the output on the fly using a handheld, desktop, or floor switch (switches not included). 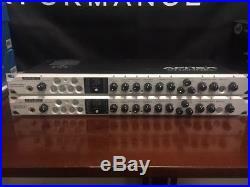 The item "Aphex Channel Master Preamp Input Processor RPA Tube Preamp Compressor Pristine" is in sale since Tuesday, March 6, 2018. This item is in the category "Musical Instruments & Gear\Pro Audio Equipment\Preamps & Channel Strips". 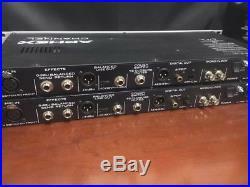 The seller is "ratsoundsystems" and is located in Camarillo, California. This item can be shipped to United States, Canada, United Kingdom, Denmark, Romania, Slovakia, Bulgaria, Czech republic, Finland, Hungary, Latvia, Lithuania, Malta, Estonia, Australia, Greece, Portugal, Cyprus, Slovenia, Japan, China, Sweden, South Korea, Indonesia, Taiwan, Thailand, Belgium, France, Hong Kong, Ireland, Netherlands, Poland, Spain, Italy, Germany, Austria, Israel, Mexico, New Zealand, Singapore, Switzerland, Norway, Saudi arabia, Ukraine, United arab emirates, Qatar, Kuwait, Bahrain, Croatia, Malaysia.